The US Forest Service is accepting comments on a preliminary Environmental Assessment of a plan of operations to conduct baseline hydrological and geophysical testing on their proposed toxic tailings location for Rio Tinto’s proposed mine at Oak Flat. The deadline for comments in April 12, 2015. Rio Tinto wishes to dump toxic tailings on public land managed by the US Forest Service north of Highway 60 between Superior and Queen Valley (roughly across the street for Boyce Thompson Arboretum). Rio Tinto wants to drill 16 groundwater testing and monitoring wells, 41 geotechnical drill holes, and 32 deep geotechnical test trenches. They want to “improve” more than 12 miles of Forest Service roads, use either illegal or user constructed roads, and go off road to disturb another 11 acres. 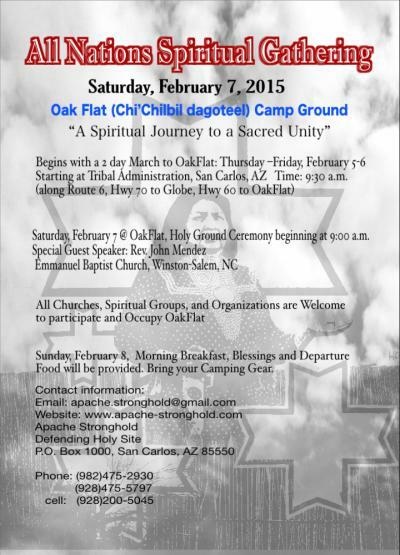 Saturday, February 7 will be a day of speakers, music, inspiration, and sharing to protect Oak Flat. Please attend the gathering and to bring your friends, family, and colleagues. Saturday will be a beautiful day in a beautiful place. 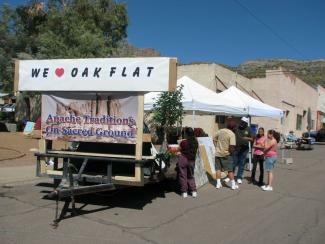 It will be a great way to learn more about Oak Flat, why we are protecting it, and what you can do to help. Oak Flat Campground is located south of US Highway 60, 4 miles east of Superior, AZ. You will see a Highway sign for the campground coming from either direction on Highway 60. Follow signs into the campground. In December, President Obama signed the National Defense Authorization Act into law. It included the Oak Flat land exchange, which allows for multi-national mining company, Rio Tinto, to move forward on a proposal for an enormous copper mine. The mine would decimate a piece of the Tonto National Forest of Arizona, including the popular recreation area, Oak Flat. While the environmental impacts of this project would reach generations into the future, the absolute disregard for indigenous rights to the area has made the call to action on Oak Flat a moral imperative. The land near the Oak Flat Campground is a sacred site to the indigenous tribes in the area, including the Apache bands. The new law allows Rio Tinto a run-around to avoid complying with indigenous rights to the land. Activists have been working for many years on the issue and actions are being planned this winter throughout the region to raise awareness and stop the destruction of this wild and sacred space. Yesterday, December 12, the US Senate passed the National Defense Authorization Act (NDAA). The Defense bill contains the Oak Flat land exchange. Please contact President Obama and ask him to veto the NDAA. This is our only step left to stop the land exchange from becoming law. You've taken action many time to help protect Oak Flat and I'm asking you now to take action one more time to protect Oak Flat. There are so many reasons that attaching the land exchange to the NDAA is a terrible idea. But let's face it, RIo Tinto's supporters knew that this was there last best chance to give Oak Flat to a giant foreign mining company. Every day we were learning more about how critical Oak Flat is for religious freedom and environmental protection and Rio Tinto knew they needed to act fast. So, they buried the land exchange deep in a anrelated bill. Let our President know that the NDAA must be vetoed until the Oak Flat land exchange is removed. After you have sent your letter to President Obama, also sign a petition asking the President to stop this Apache land grab. 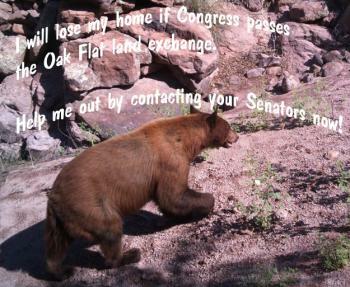 Contact your Senators today to remove the Oak Flat land exchange from the National Defense Authorization Act (NDAA). And it bypasses the normal process of permitting mines on public land. President Eisenhower placed Oak Flat off limits to mining 60 year ago and it remains an ecological, spiritual and recreational haven. In spite of the will of Congress not to pass the Oak Flat land exchange, its supporters snuck the bill into the defense bill (Section 3003 on page 1103 of a 1,600 page bill). The language of the bill was changed, but is still completely unacceptable. Please contact your Senator immediately and ask him/her to remove Section 3003, (the new number for the Oak Flat land exchange) and to pass a clean Defense bill. 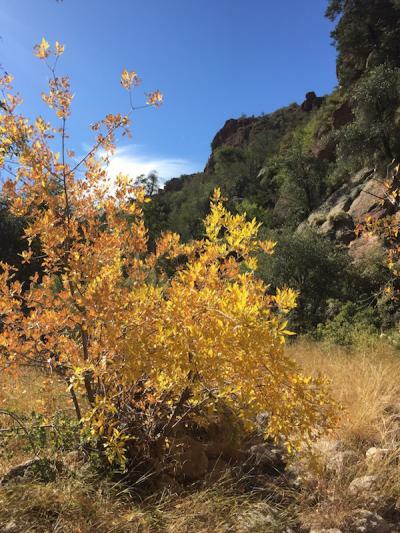 Sycamore in Full fall color in Gaan CanyonWe have learned today that the House of Representatives leadership is trying to add the Oak Flat land exchange to the National Defense Authorization Act as part of a package of public lands bills. Your help is needed immediately to contact your Representative and ask him/her to oppose the Oak Flat land exchange (HR 687) under any circumstances and especially as a rider onto a Defense bill. The Oak Flat land exchange is the only bill in this Congress that would give a Native American sacred site on public lands to a foreign mining company, would be the largest single loss of recreational opportunities on public land, and would circumvent the normal process of permitting mines located on public land. The House leadership brought the land exchange to the House floor for a vote twice a year ago, but pulled it at the last minute because they could not defeat an amendment to the bill that would have prevented the privatization of an public land that is sacred. Why is it that at the end of every Congress, Rio Tinto's supporters try to sneak the land exchange through Congress in the dead of night? Send a letter to your Representative to stop the Oak Flat land exchange now! Congress has returned for a final session and some Senators may attempt to bundle the Oak Flat Land Exchange, S. 339, with other bills that deal with public lands. Most of these bill are good bills, but adding the Oak Flat land exchange to the package would poison the entire bill. S. 339 is a land exchange that foreign-owned Rio Tinto mining company has convinced Arizona members of Congress to introduce on their behalf, a giveaway of land that is sacred to the San Carlos Apache tribe. The bill would be the only bill in Congress that would give away a sacred site to a foreign corporation, would be the largest loss of recreational climbing on public lands, and would overturn a ban on mining at Oak Flat that was put in place by President Eisenhower. This is nothing new. At the end of every Congress, Rio Tinto's supporters in Congress try to bypass normal procedure by attaching the land exchange to an unrelated piece of legislation. They know they cannot pass the land exchange in the light of day, so they resort to these behind the scenes maneuvers. 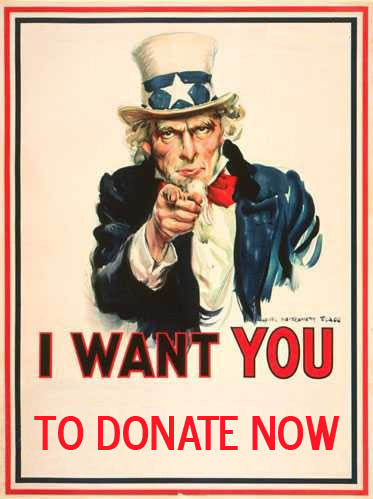 We've helped to stop this bill before, now we need your help to do it again! Tell your Senator that privatizing federally protected lands and turning them over to a foreign mining corporation without federal environmental review or public input isn't right. 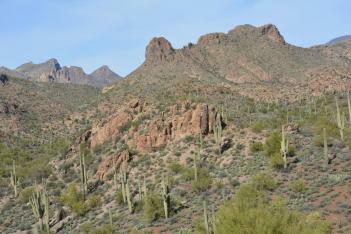 Sacred sites, recreation and the sensitive ecological area surrounding Oak Flat are more important than a copper mine. 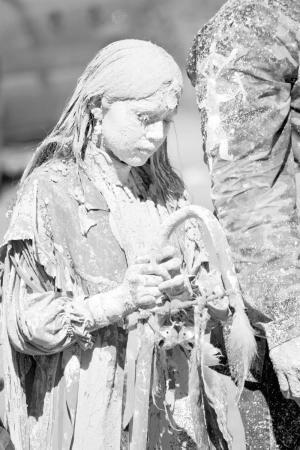 Tell your Senator to save Oak Flat from foreign mining companies! This morning, April 18th, 2013, Rio Tinto held their Annual General Meeting in London. Our Director, Roger Featherstone, was in town and attended the meeting. 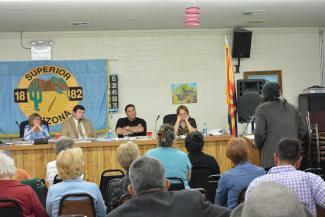 During the council meeting Rio Tinto threatened to lay off it's workers if the town passed the resolution. This is similar to a threat Rio Tinto made last November to lay off most of their workers is the previous version of the land exchange, HR 1904, was not approved by Congress. There is no word yet whether Rio Tinto will follow through with their threat now that the resolution has been passed. See a copy of the resolution.